IPCC turn used stamps into money to help our work of saving Irish bogs. Valuable stamps that are spotted are sold separately, but even perfectly ordinary stamps are welcome. They get made up into packs for sale in IPCC’s Nature Shop or are sold in bulk in Ireland to stamp dealers. Our collectors campaign is worth €10,000 each year to IPCC. If you can help us, please put your stamps into an envelope and send them to: IPCC, Lullymore, Rathangan, Co. Kildare. There’s no need to lift them off the paper, but if you have time to trim them leaving a 1cm margin all around, we’d be delighted. All of the items IPCC collect are used to raise funds in support of the Save the Bogs Campaign. As a charitable organisation this is an important source of income for us. around the edge and we then sell them by weight to Irish and international stamp dealers. They are also sold as stamp collectors packs in the IPCC Nature Shop. 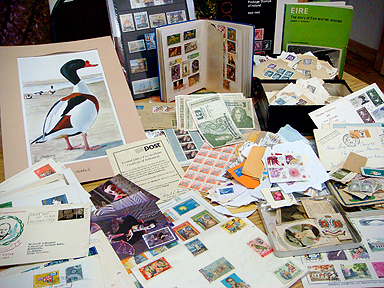 Last year alone we received 83,000 grams of stamps from our supporters and the general public. First Day of Issue Stamp Covers from Ireland, the UK and the World are sold at auction to collectors. Used Telephone Cards are also sold on to collectors. particularly interested in John Hinde cards, cards with a bogland or turf interest and old postcards. Some of the more general and modern cards we recycle with stickers on the back for use here in the office when writing to supporters. euro if the currency is still valid. We sell coin packs to collectors who visit the IPCC Nature Shop and we place older coins in collectors auctions. Bus Atha Cliath Refund tickets are reclaimed. Please send your donations to Irish Peatland Conservation Council, Bog of Allen Nature Centre, Lullymore, Rathangan, Co. Kildare. Email: bogs@ipcc.ie; Tel: +353-45-860133. Thank You.